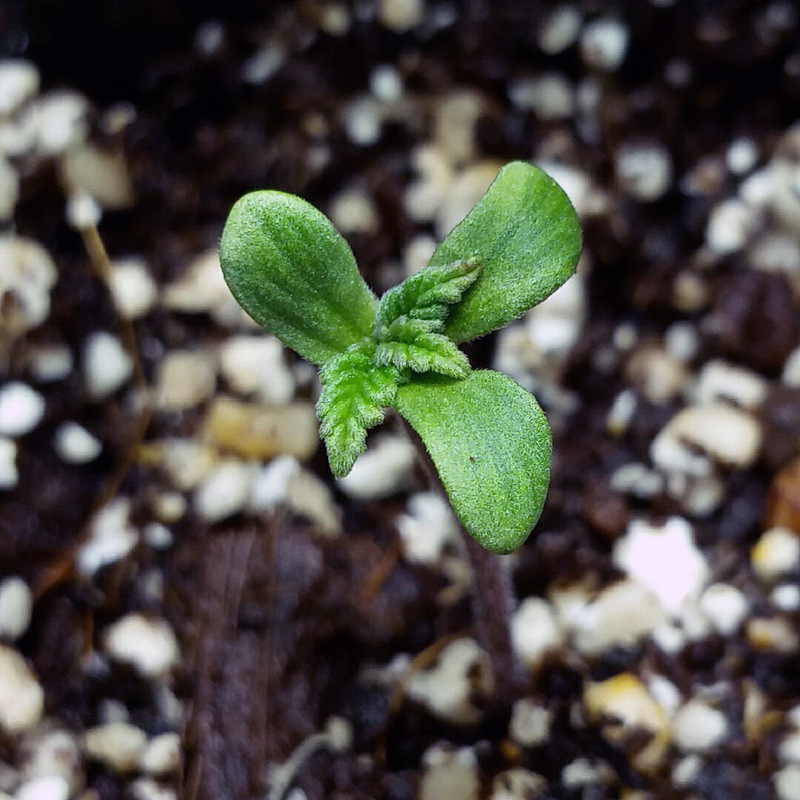 Were at day 53 today from sprout breaking soil, no vegging as its an auto, just make the environment happy for them. 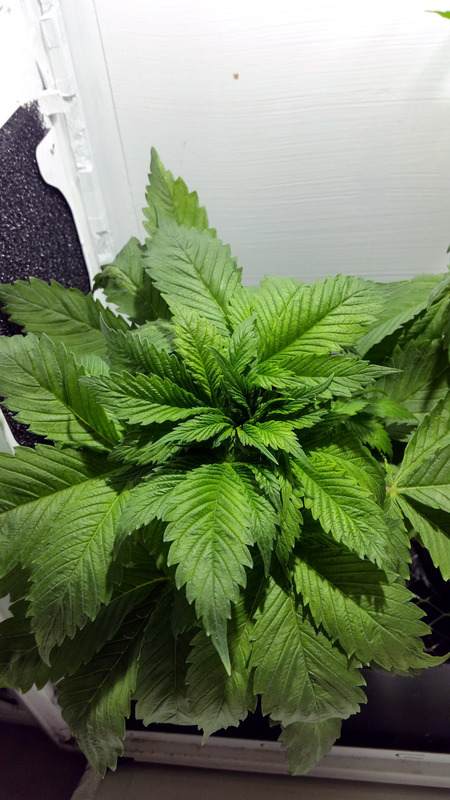 Yeah autos, same ones you got, but im running these at 18/6 so they are great to throw in veg spaces to fill up space if your running photos, its initially what i started doing now im only running autos as i like the quick turnaround time on the quicker strains. 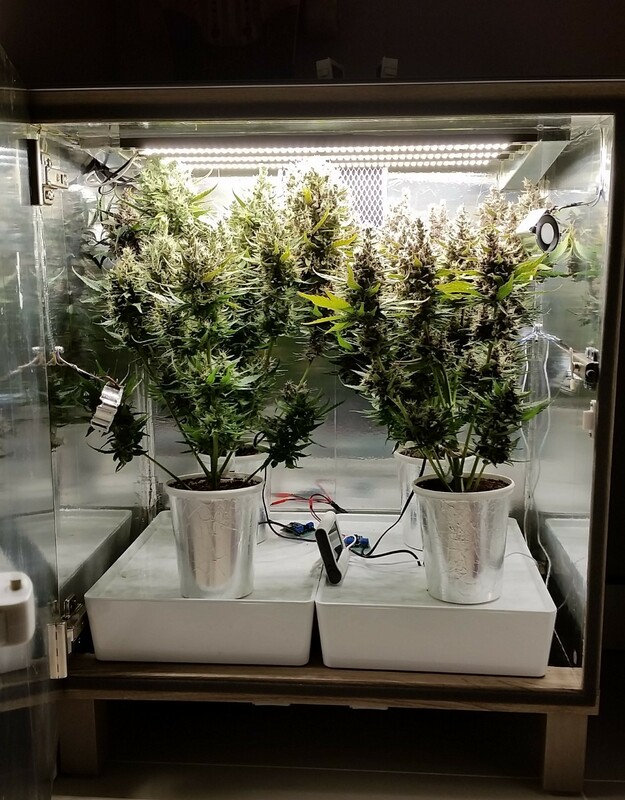 My guess is possibly 30 for that plant maybe, and 18-25 each for the rest, as the two on the left aren't as beefy, even though that green pheno looks like it, its pretty airy. But honestly no idea, and im not gonna count my chicks before they hatch per say. im only running at 99w and typically on the better runs i get just below that 1g/w range so im aiming for that, but who know i may be surprised when things get weighed later. Hey @Mr.Sparkle ..check out this dark devil f2...its a trifoliate...nice.....none of the others did this....is it a gem.?????? How many days there you got till they're chopped? @2tokejoke Probably not ive had that happen once before with these plants but on an f1 seed and under different conditions, haven't had the f2's do that yet for me, but im not surprised to see it as really its a mixed bag almost at what you will get with the f2's, but mine just grew a bit slower than the rest and stayed squat but was very wide. Who knows maybe it will be. Got 4 seedlings showing colydones no mutants thought..i Thought those are lucky ! Day 55 would of did a post yesterday but OG was down due to that server power supply issue, but lemonadejoe got it fixed, high five to him. Anyways decided to take new pics this morning just to reflect the day. So plants are going good, back right plant will be finishing first with how it looks, the green front left pheno is gonna be finishing last, as its still trowing out pistils and new calyxes. Almost there though, maybe another week or less for some. topped of the reservoirs with just water, they are at around 300ppm, also been rotating the left front plant around a bit just to help it finish as it was kinda jammed in the corner, but it had been rotated back to its original position for the photo, just in case i want to make a time lapse later. this is the real forest treehouse. 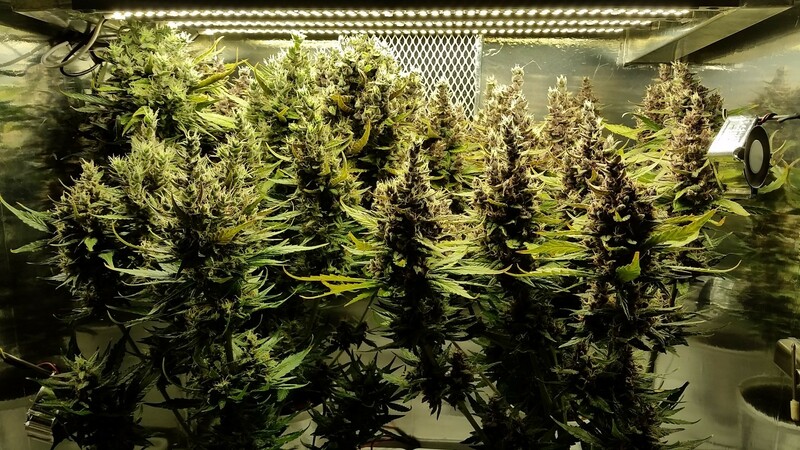 Very beautiful grow. I like how your spaces are always clean and neat. Day 57 yeah week or under for the plant in the back right, others bit more, and the left from green pheno bit more than that. Not to shabby at 8 weeks from sprout. Looks like a little Christmas tree farm in a pretty silver box! Great looking ladies @Mr.Sparkle! 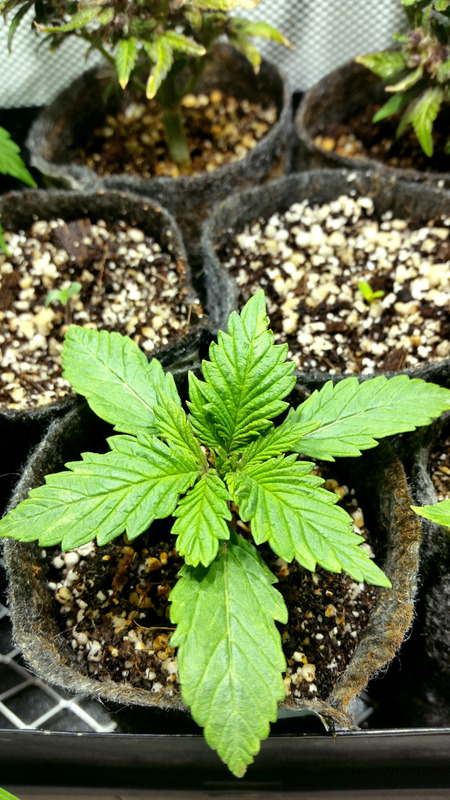 My outdoor autos aren't looking to bad either considering first time grow in new soil! @Mr.Sparkle, That grow looks awesome. I hope to someday be able to pull a crop like that together. Day 59, there reservoirs have now been filled at a low low 100ppm for the last week or so, as they have enough stored. Also adjusted a few tops just to get better light to finish. Pretty much, which means more plant to play with for me. 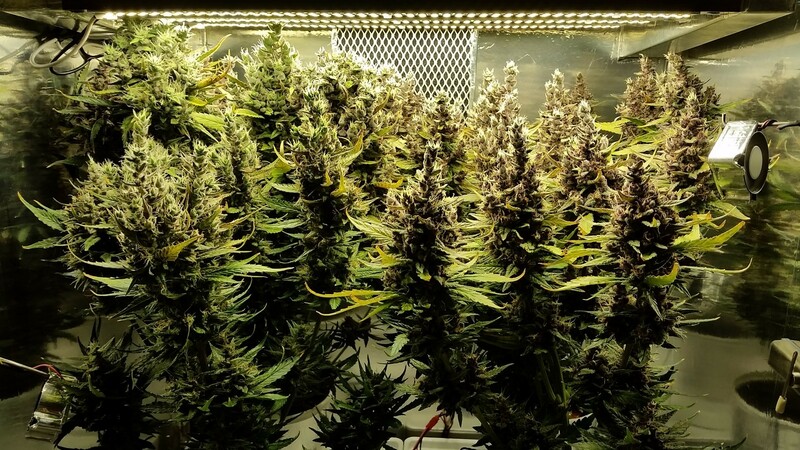 Now saying that, say for possibilities that someone utilized their standard veg space in a photo grow or made a smaller one, you could even run them 2.5-3 weeks in that space before flipping to you main "flowering location" which say with a 9 week strain, you would be cutting that time down to 6-6.5weeks. Effectively running 8 cycles per year, vs say 5.75 cycles of a comparable 9 week photo strain. Hey @Mr.Sparkle was wondering what you do for training on your plants do you Fim, or Supercrop or a combination of things? Your growth is so even without scroging ! Nothing if i can help it, but i just flopped over the tops as needed in this case but do a lot more if need. The flopping the tops is more or less super cropping, except i pinch/crush the stem over a span of 1-3" as they you have a better radius for the stalk to still function and a lot less likely chance to split the stem wall which can happen on sharp radius. After i do that i usually just tie down the tops with a rubber band back to the main stalk, just to hold them down till the heal. 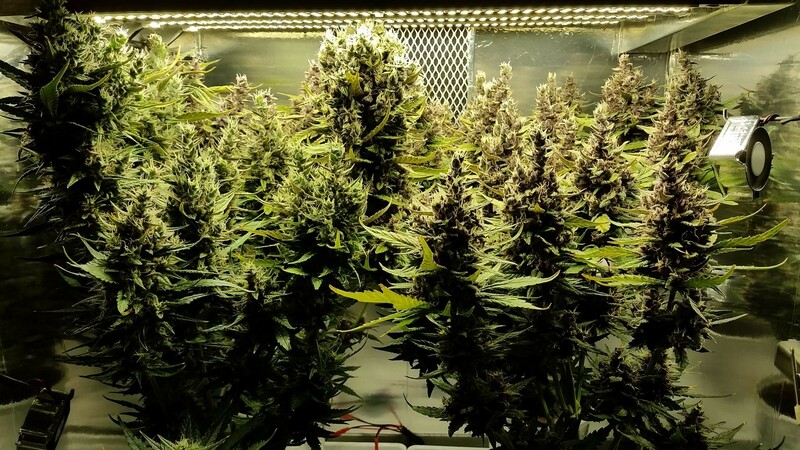 Usually after a week or two you can remove them if you have the height as they will still stretch for the light, but if not i just leave them on till harvest or last couple of weeks. Its what it had to do in this case, the two on the right are held down with rubber bands, but the two on the left were adjusted with the flopping, but i removed the bands after a week or two, which i probably should of left.